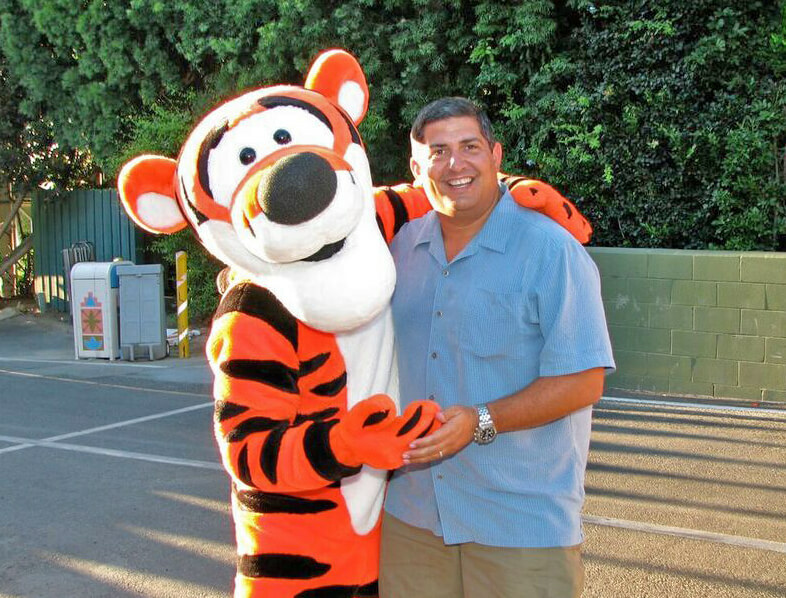 No matter how old you are, you never get tired of meeting your favorite Disney characters in the parks. The trick is knowing where to find them. Sometimes they unexpectedly appear—especially at the Disneyland Resort—and that is pure Disney magic. They do, however, tend to frequent their favorite spots in the parks. 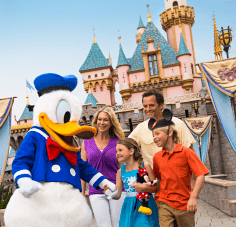 If you know where they might be, you can increase the likelihood of meeting your favorite Disneyland characters on your next trip! If you are going all the way to Disneyland, you can’t get by without meeting the big cheese himself: M-I-C-K-E-Y M-O-U-S-E! Mickey and his friends are often at the top of everyone’s must-see list. 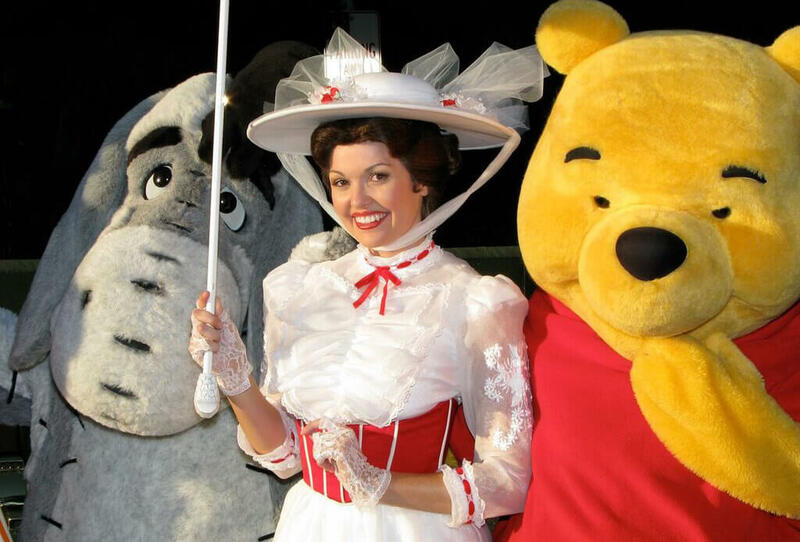 You can find these classic characters at Disneyland and Disney California Adventure. In Disneyland, most of them are almost always near the entrance to the park. After you walk through the tunnels, you can find them in the middle of the circle in front of the train station, by City Hall, near the Mad Hatter and in front of other stores and Great Moments with Mr. Lincoln. The morning and early afternoon are popular times to find them here greeting all the guests coming into the park. Another area these Disneyland characters frequent is Toontown. Mickey and Minnie greet guests and pose for pictures in their houses, and their friends are often about on the streets of Toontown. At California Adventure, you can meet these same classic characters along with Oswald the Lucky Rabbit on Buena Vista Street. Keep in mind, they're dressed in vintage clothes. 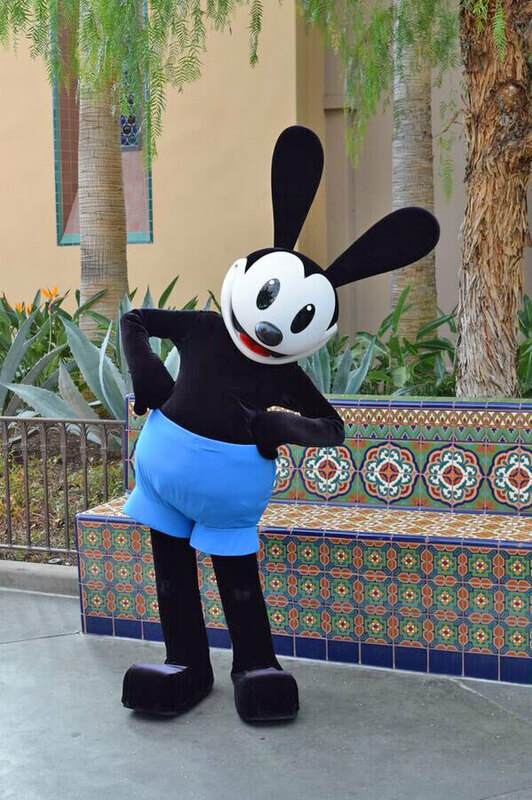 Oswald is usually the first or last character you see when you either come in or exit the park. You can meet Chewbacca and Darth Vader (for a time period it was Kylo Ren and he may return) at Star Wars Launch Bay during the Season of the Force. 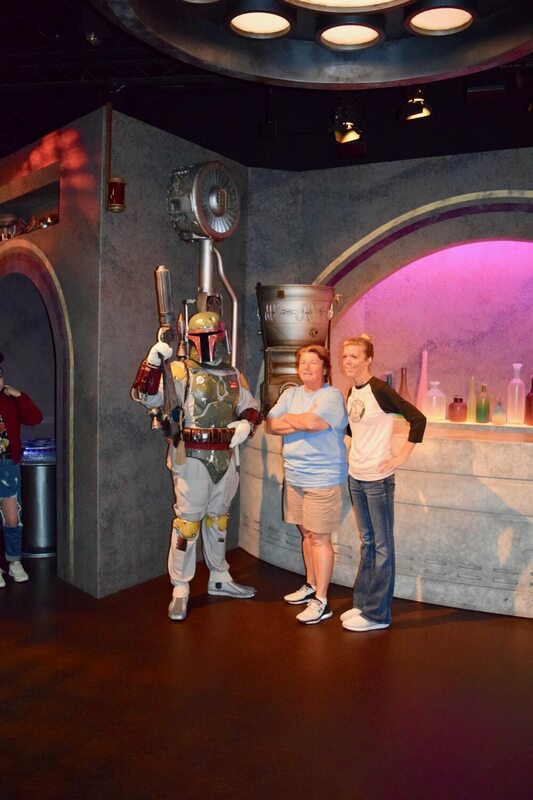 You can find Boba Fett at the Cantina. The characters from the dark side are a little intimidating (and even a little scary), whereas Chewbacca on the light side is all hugs and fun. Kids ages 4 to 12 can battle Darth Vader or the Seventh Sister Inquisitor in Jedi Training. Stormtroopers patrol all of Tomorrowland. You may see them in line at Star Tours, guarding the entrance to Launch Bay or stalking the streets of Tomorrowland. They will decide if they want to stop and talk to citizens (unlike the other characters who can’t wait for guests to visit them), so there is not official line or location. If you are wearing Stormtrooper themed clothing—even a sweatshirt or T-shirt—it seems to increase the odds that they will talk to you or summon you over to join their ranks. Not a guarantee, but let’s just say we’ve seen it happen. You’ll find Captain America and Spider-Man in Hollywood Land in Disney California Adventure just down the street from the new Guardians of the Galaxy—Mission: BREAKOUT! ride (opening May 27, 2017). Summer of 2017 also brings the Summer of Heroes starting that same date. There will be new Super Hero encounters as well as continuing ones. Year-round character encounters will include Groot as well as Spider-Man and Captain America. During the Summer of Heroes you will also be able to meet Black Widow. She and Hawkeye will be assembling young recruits to complete a series of tests to see if they have what it takes to be an Avenger. Other heroes in Hollywood Land include the Incredibles. They wander about and do not have a set location. 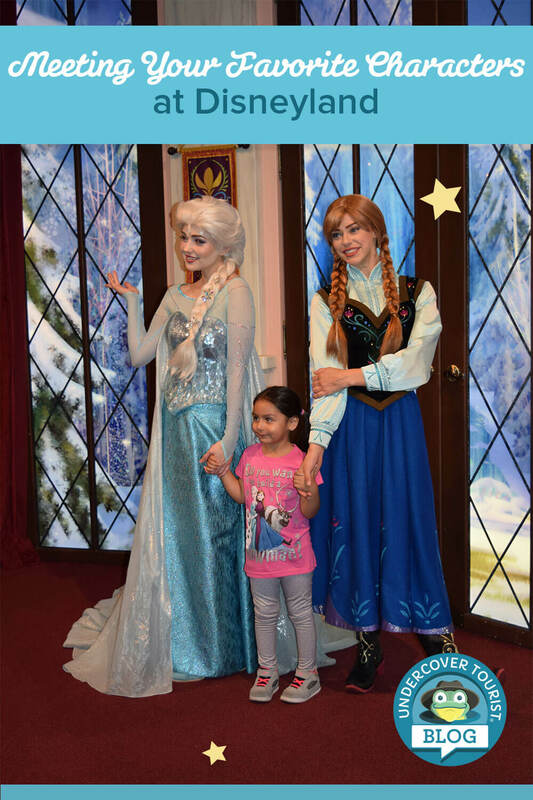 Lily recently shared how to meet the Disneyland princesses (and even some of their friends like Flynn Rider). You can find all that detailed information here. 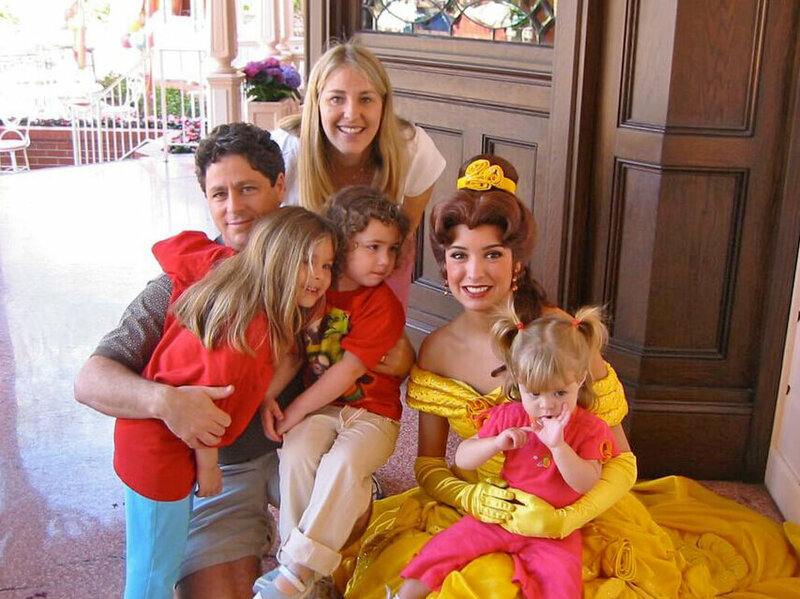 Most Princesses stay in Disneyland Park. Several can be found in or near the Royal Hall in Fantasy Faire. There are exceptions. We recently came across Pocahontas near the Rivers of America. She says she is usually off exploring with John Smith, but when she is in the area, she visits guests at Disneyland. 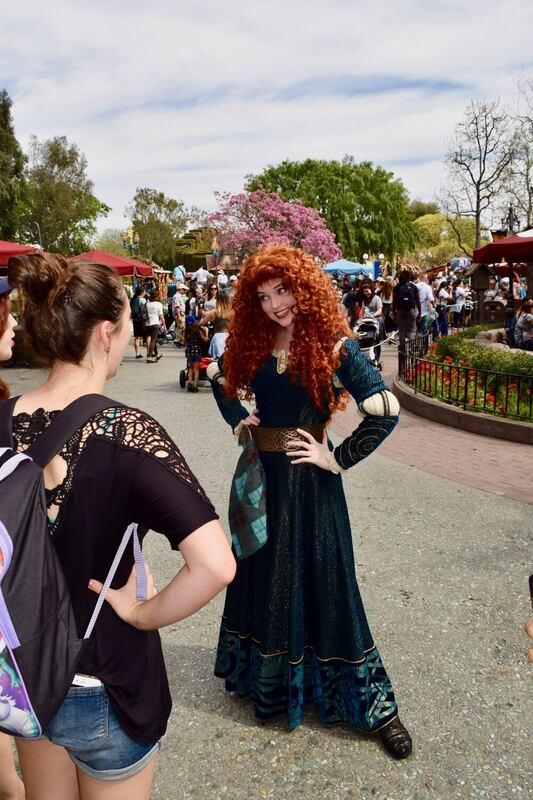 Merida strolls around Fantasyland. Anna and Elsa (along with Olaf and Kristoff) are in California Adventure. Other princesses do make special appearances at Disney California Adventure during certain holidays. Tinker Bell and her fairy friends flit about in Pixie Hollow. Beware! Captain Hook has been known to lurk about near Fantasyland. Keep an eye out for Tinkerbelle’s friend, Peter Pan. He rarely stays still but is awfully fun if you do find him. Where are Winnie the Pooh and Friends? You can meet Winnie the Pooh (plus Eeyore and Tigger too) after exiting Splash Mountain or The Many Adventures of Winnie the Pooh ride in Critter Country. 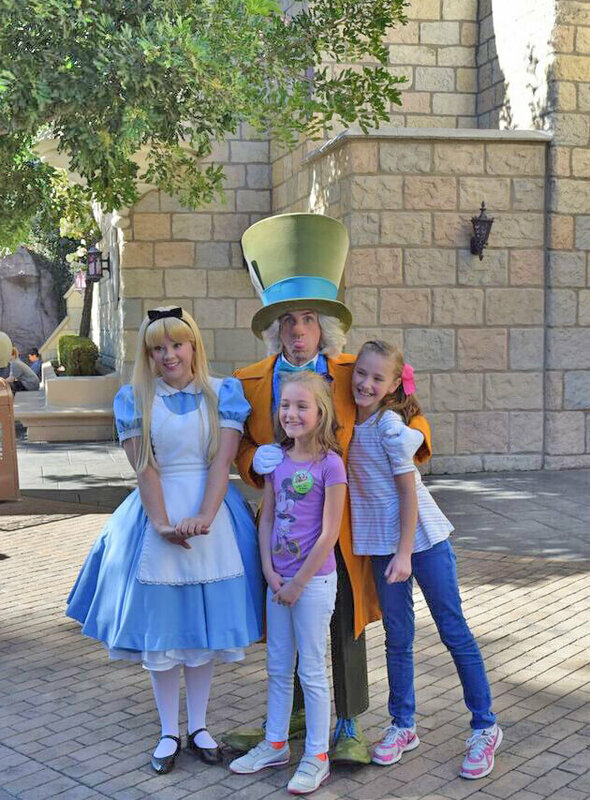 Alice and the Mad Hatter make appearances near the Tea Cups and the Alice in Wonderland ride. This duo is quite humorous, and the two love to have funny chats with guests. Gaston and the Beast have been wandering around Fantasyland. Gaston also frequents Fantasy Faire, always on the lookout for Belle. If you run into Gaston looking for Belle, shhh … don’t give her location away. She is usually safe inside the Royal Hall with her princess friends. Woody and Jessie have a new post, welcoming guests near the entrance to Frontierland. They and other Toy Story toys (such as Buzz Lightyear) also like to meet their fans at Paradise Pier in California Adventure. 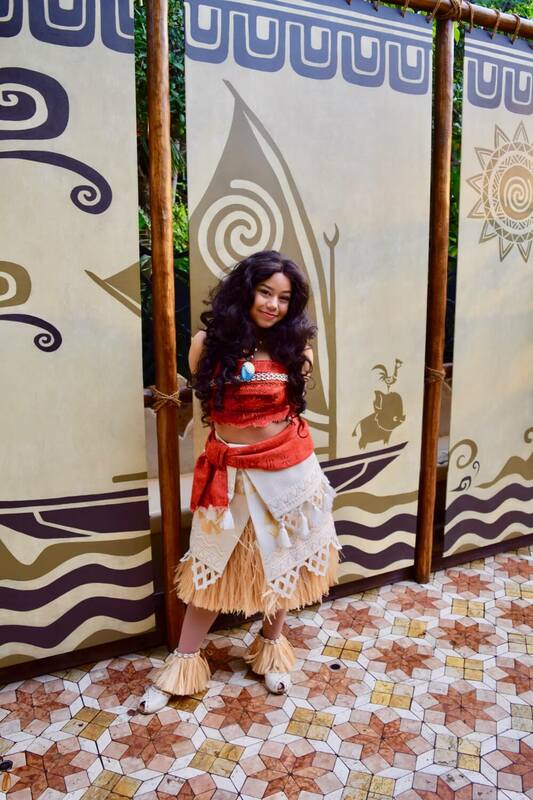 Moana of Montonui has started greeting voyagers near Aladdin's Oasis inside Adventureland. Aladdin and Jasmine have been spied in Fantasy Faire. The residents of Radiator Springs also drive out to meet people in Cars Land at California Adventure. They also have some dance parties right there in the street, so be sure to check the schedule for those character experiences. 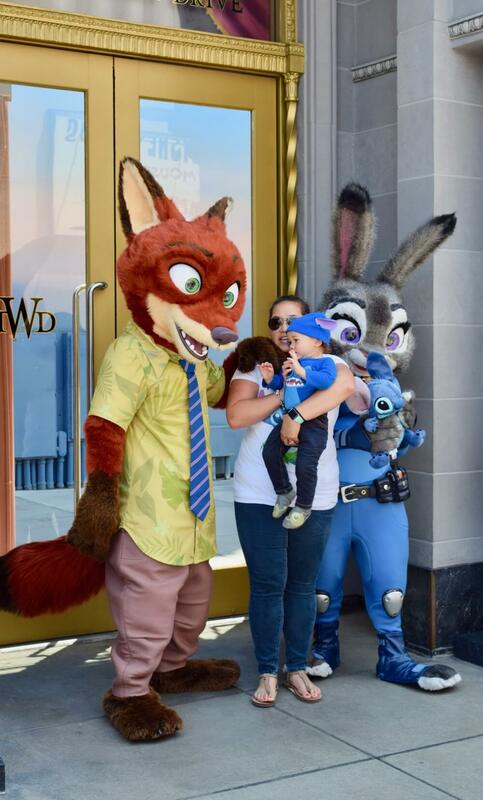 Sometimes Nick Wilde and Judy Hopps greet fans in Disney California Adventure. They hop around to different locations these days. 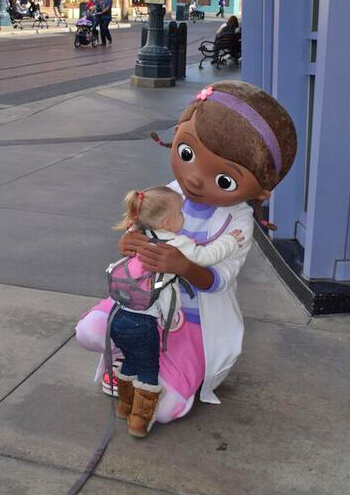 Doc McStuffins and Sofia the First get so excited when they meet their young Disney Junior fans in Hollywood Land in California Adventure. Cinderella’s Fairy Godmother flits around Fantasyland near the Bibbidi Bobbidi Boutique (inside you can be magically transformed into a princess as well) or other Fantasyland attractions. Dr. Facilier and Tiana greet guests in New Orleans near the Rivers of America. The Evil Queen from Snow White has been lurking about near Fantasyland, often between Pixie Hollow and Alice in Wonderland. Be sure to bow before greeting her. You can meet various characters from A Bug’s Life in Bugs Land. The Citizens of Buena Vista Street in California Adventure, might not be your traditional Disney characters, but they are a lot of fun, and quite chatty. There are always other characters popping up. Mary Poppins—the best nanny ever—sometimes appears near the Baby Care Center, which is one spot you need to explore if you are taking a baby to Disneyland. You'll also find her and Burt strolling past the castle, around Main Street and through Fantasyland. They do not stop for photos, but they welcome guests to stroll along and have a chat with them! And then we have caught them posing with guests near the entrance. They like to keep you guessing. There are often other characters just inside the park entrance, but you never know whom you will find there. It could be a princess, a villain, a classic favorite or a surprise obscure character. It is always best to look around when entering or exiting the park to see if you can spy a special character. You never know which Disneyland characters you are going to meet in either of the parks. They update character experiences all the time. Disneyland is much more spontaneous than Disney World when it comes to characters, and we've noticed a growing number of wandering characters lately. Disneyland is full of surprises— the better to keep you hopping and entertained. So be sure to keep your eyes open for opportunities to meet characters. You may find them simply walking next to you! It is fun when you come across a toadally unexpected character. One time we were hopping past Ariel’s Grotto character dining restaurant in California Adventure, and Mickey, Donald, Chip and Dale came running out and involved us in an impromptu game of Duck Duck Goose right on the pier! You just can’t plan this type of thing, but when it happens just go with it and enjoy the magic. Some characters only make appearances during certain seasons. Jack Skellington and Sally are some of the more popular “villains” to greet during Halloween time, but you can also find Cruella de Vil, Jafar, the Queen of Hearts, the Evil Queen Dr. Faciller and others, especially during Mickey’s Halloween Party. During ¡Viva Navidad! in California Adventure. you may see members of the Three Caballeros, Princess Elena of Avalor or other characters. 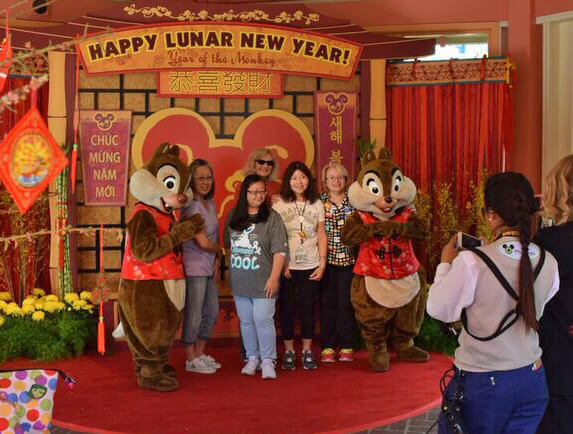 Mulan, Mushu, Mickey, Minnie, Chip and Dale celebrate Lunar New Year in California Adventure by taking photos with guests. Classic characters will also be wearing their New Year’s best during this celebration. During the Holidays at Disneyland you can meet Santa Claus in either park. He just might be replaced with Santa Goofy after Christmas—Santa does need to rest. Most characters are out (on and off—they do need to take breaks) from the park openings until late afternoon. If you are having trouble finding your favorite character, you can ask questions at the information booths. 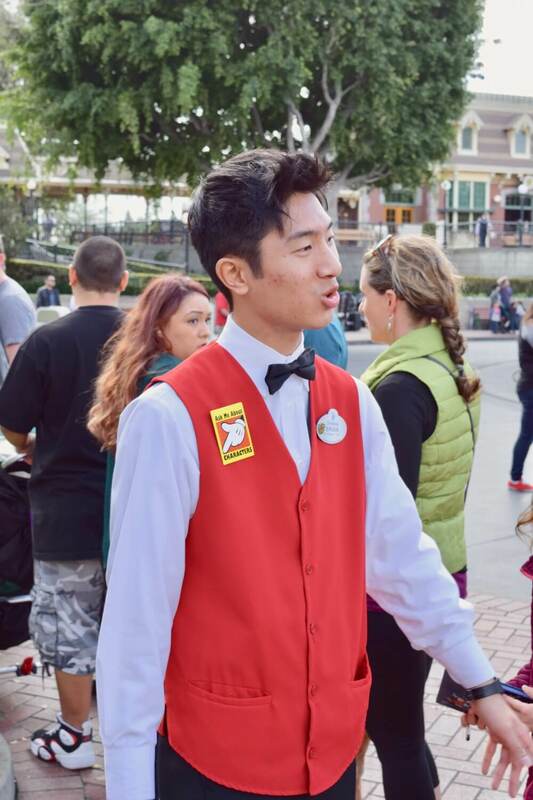 Keep an eye out for Disney cast members wearing buttons that say, “Ask me about Characters.” They might be able to help you or might even consult the Toon Finder to find out when and where you can meet them. The Disneyland Park app can tell you where to find characters, but it is not always reliable since so many characters move. If you see character Cast Members standing still and there is no character nearby, remain close. A character is on his or her way to this exact location, and you can be one of the first in line to greet them. Keep that camera and autograph book handy! Sometimes meeting a character is overwhelming for toddlers and small children. Lily loved hugging some characters as a baby and then suddenly the idea of posing for a picture with Mickey Mouse at age 2 made her cry. Now she is back at it, always searching for her favorite princesses. This is completely normal and very common. If your child suddenly fears a life-size Goofy, don’t worry. A little stranger anxiety is a healthy and normal stage, and it can be very emotional meeting your favorite Disney star. The characters are much bigger in person than on TV. You will find many characters get down on the ground to greet their smallest guests eye to eye for this reason, but don’t force it if you child is afraid. Wave to the character from afar (visiting from the stroller always feels safer) and limit your character experiences to rides and parades. We promise they will grow out of it and will be happy to meet them again soon. Another way to meet Disneyland characters either in or out of the parks is to make a reservation through Disney Dining for a character dining experience. You will be sure to meet many different characters at Disneyland this way without having to look for them or wait in lines. No matter where your character experiences take place, they will make for hoppy special memories indeed. 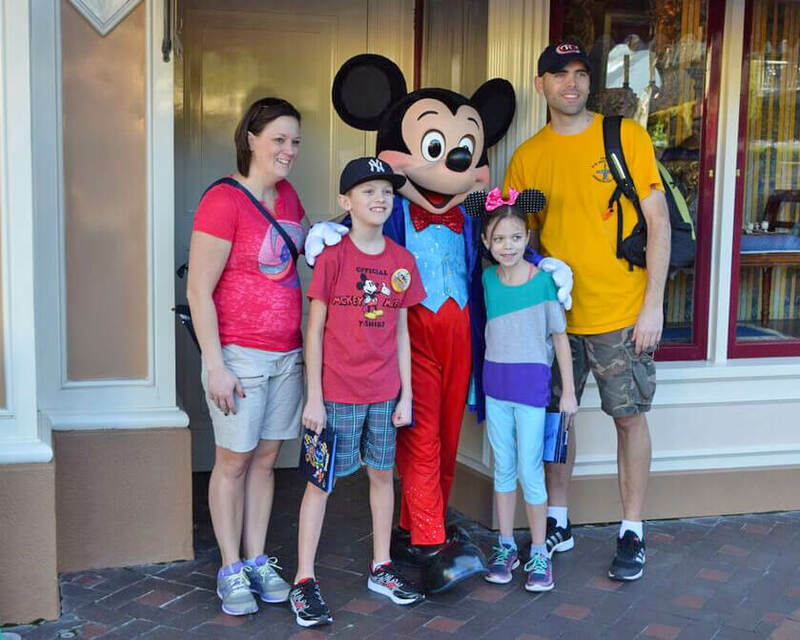 Have questions about meeting Disneyland characters? Share them in comments below! This article should tell you where you find all characters ???????????????????????????????????????? HOW ARE YOU TODAY? 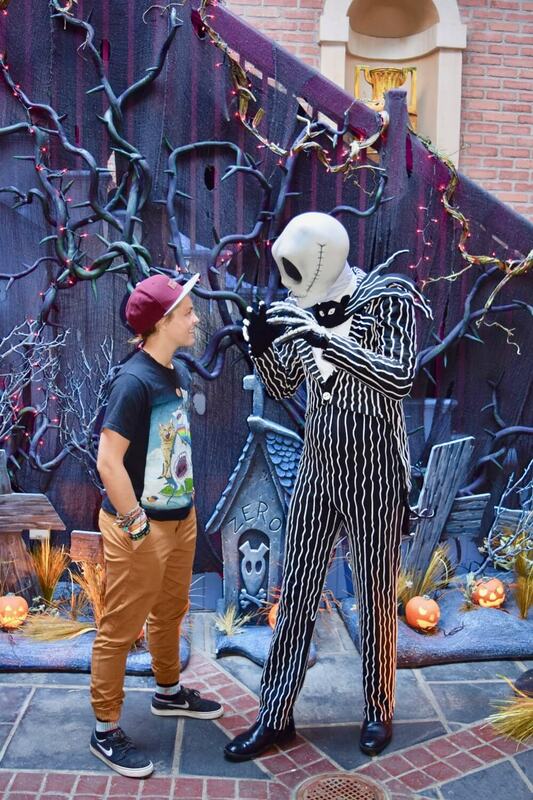 TAKE A MY TOMMY DULANEY PICTURES MEETS AND GREETS I LOVE YOU DISNEY WORLD AND DISNEY CRUISE LINES. GOOD LUCK AND HAVE FUN AND SEE YOU SHOW.